Developer website: Ambrosia Software, Inc.
Is there a better alternative to iSeek? Is iSeek really the best app in Internet Utilities category? Will iSeek work good on macOS 10.13.4? 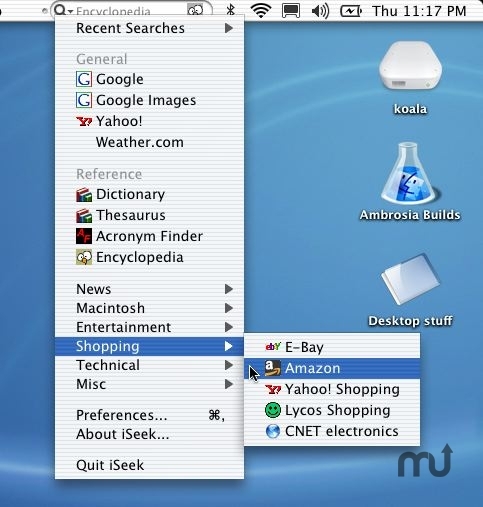 iSeek is a handy little program for Mac OS X that allows you to instantly search for anything you seek, no matter what program you are running. 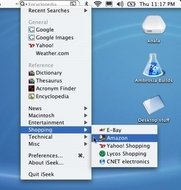 iSeek puts a familiar search field in your menu bar, needing just a click or keystroke to start your search! iSeek needs a rating. Be the first to rate this app and get the discussion started! iSeek's slick and seamless interface hides a significant amount of power and convenience. iSeek is no mere front-end to Google, it will ship with pre-configured search shortcuts for dozens of useful Internet resources. Look up a word definition in the dictionary, or a synonym in the thesaurus, or even famous quotes that reference the word. Search for information on Google, in popular news sites such as the BBC News, MacNN.com, or even search for software on MacUpdate.com. Anything that is searchable on the Internet can be added to iSeek as a search shortcut that's available in a snap, and your recent searches are saved, too, for even quicker access. The real power of iSeek is that it is also highly configurable: you can add whatever search sites you find useful, and easily share them with your friends.